Think tank recommends reform in language education to reflect modern society. More schoolchildren should be given the opportunity to learn Chinese and Urdu, a new study has suggested. 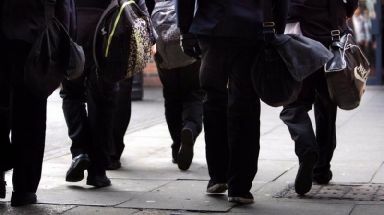 Reform Scotland made the recommendation as figures showed a drop in numbers of pupils taking "traditionally taught" languages in Scottish schools. Over the past 20 years, entries for higher grade French have fallen by 18.2% and entries for German by 58.4%. In contrast, entries for higher Spanish exams increased by 219.8% increased over the same period, while Chinese entries have increased by 17.8% in the past two years. The think tank has now set out a raft of recommendations in a report calling for a fresh approach to be taken towards language teaching. Reform Scotland director Chris Deerin said: "If we want to see genuine growth in language skills in Scotland, rather than just paying lip service to the idea, we need to rethink our approach. "There is a danger the languages currently on offer within the education system are not keeping up with Scottish or global society. "We need to think much more freely - as many other countries do - about how best to equip ourselves to thrive in the modern global economy. Brexit, the shift of power from west to east, and Scotland's pressing need to secure greater economic growth, all demand fresh ideas." The report also calls for an end to distinctions between "community" and "modern" languages so that learning reflects the increasing number of communities in Scotland speaking languages such as Polish, Arabic and Urdu. Dr Thomas Bak, University of Edinburgh's School of Philosophy, Psychology and Language Sciences, added: "Language skills are an indispensable part of a diverse, open minded and globally successful society and economy."